Whew. We are almost done, people! The pantry and the freezer are both looking fairly bare. I’m tempted not to buy too much right away just so we can clear away the little hodge-podge bits that are left. 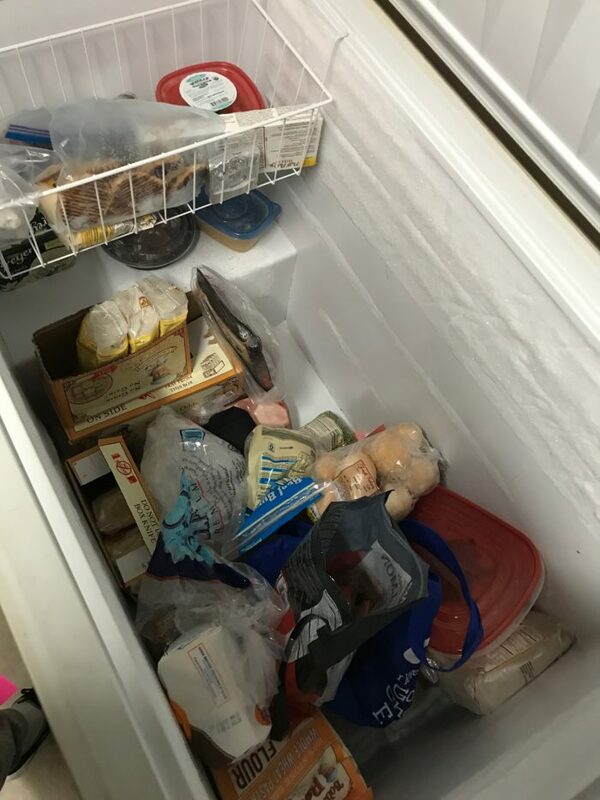 The freezer contains mostly baking ingredients and whole grains as well as some desserts that I would really like to get rid of. Kids may have a sugar fest in the next few days. The pantry is to the dregs, yet there are still some random bits, like the black eyed peas I never used in gumbo and never even opened, and the new bags of couscous and barley. I don’t really want those items to get lost in a sea of new items, so I need to make a plan to use them.But, I’ll admit; the natives are getting restless. My husband keeps asking when it’s going to end. Not that he’s been starving, but whatever. Yesterday was Bryan’s birthday, so he took the afternoon off to celebrate. We ended up having both lunch and dinner out which made it super fun and a nice little vacation day. The weather was gorgeous so we went to one of our favorite burger restaurants. Most of the kids had never been there before since it’s often a date night place. Chipotle took care of dinner which is a good thing. My cold is not getting better! So much so that I let the kids have birthday cake for breakfast. Yes, really. At lunch time, I thawed the last bag of rolls and some Split Pea Soup I made awhile back. Not many of us like Split Pea Soup, so I also made a Bean and Rice soup for the kids. This afternoon I popped into Ralphs for pasta, cream, and bread. I’m just not feeling well enough to be too creative. This cold is kicking my tail. Again. So, dinner was a nice Italian pasta meal and Bryan will have cream in his coffee tomorrow. One of those small pleasure that helps you get out of bed in the morning. Know what I mean? Just one more day, people! As always, thanks for sharing the Pantry Challenge with your friends. The more the merrier! Jessica–I am so sorry that your cold is worse! That stinks! I am you were able to go out to eat. I can’t believe the month is over. I guess time always flies. I made my grocery lists–one for Sam’s and one for Aldi. We are out of alot of things. We need salad stuff, sweet potatoes, onions, carrots, broccoli, mushrooms,cheddar cheese and bagels. Everything on this list will last thru the month except the salad stuff so this trip will be expensive. I also cleaned the refrigerator in anticipation of filling it up again. It as pretty bad but at least there weren’t any science experiments growing. We’ve done really well with eating leftovers. Lunch–My husband had some of your stuffed shell filling I made on l/o pasta. I had l/o egg bake from the other day. Dinner–He had Mahi Mahi, mashed potatoes and roasted asparagus. I had the last of the potatoes with my chicken soup and toast. Dinner was roasted pork,roasted potatoes and sauteed apples. So sorry that bug is kicking your behind Jessica! My daughter has a cold and I get a text from her at 2:30 this morning that she has been vomiting. I took ginger ale, saltines and canned chicken soup to her when I went over to watch my grandson. I couldn’t take him to our house as our son was there with our sick granddaughter. I’m praying they don’t pass on their germs to us! L – we had a late lunch out after our eye appointments in a small town about 45 minutes away. The optometrist is a long time friend and former neighbor. We stopped at an old downtown cafe that had the best food! Wow! Your kids are so blessed by you! So sorry you’re still sick 🙁 I feel like the cold is coming back as well, so I am taking a natural remedy which usually helps. We’ll see! B: Oats and milk for DH. Oatmeal for DD1. Snacky items for DD2. Toast and coffee for me – DD2 also had some toast. L: Packed lunch for DH and DD1. Snacky lunch for DD2 (she doesn’t have much of an appetite right now). Leftovers for me. I had more filling for the tarteletter in the frrezer. I made some vegetarian filling for DH. B: Oats and milk for DH. Oatmeal for DD1. DD2 slept in so had a piece og crisp bread on the walk to school. Toast for DD2 and me after dropping DD1 off at school. Coffe for me and milk for DD2. L: Packed lunch for DH and DD1. Snacky lunch for DD2. Leftovers for me. We finished the non-vegetarian filling for the tarteletter. I still have a good size portion leftover from the vegetarian filling, which I will freeze for an easy dinner later on. Dinner was chicken burritos. Hubby had the last of the ribs, cottage cheese and fruit vanilla pudding. We’re going to celebrate the end of the month with pizza since Papa Murphy’s is having a Superbowl special. Not sure which day but looking forward to it. We still have a fair amount of leftovers in the fridge. I plan to make chicken enchilada casserole today and will give the dog the last of the beef stew n her breakfast. My pantry has had a lot of use this month, but still a long ways to go. I see a lot of empty canning jars, but my freezers oye! Looking forward to see how many people plan to carry on! I’m sorry you’re still not feeling well, Jessica. This is a nasty cold season. Happy birthday to your husband!!! Jessica hope you feel better soon. Unfortunately, it seems like the crud is taking awhile to go away. Rest up when you can. Glad you were able to not have to worry about getting meals on the table, atleast for one day, and got to celebrate hubby’s Birthday. Yes! It was good timing to be sick. Sort of. I am so sorry you are so sick. It’s really hard to push thru when you’re sick and feel run down! Sick days are the reason we have restaurants. Your pantry challenge has a different meaning to different people, it was eye opening for me. I was very glad (for once) that i dont have 6 children to feed. Pantry challenge to me is an opportunity to use what is on the bottom of my freezer and a few things from my cupboard, but not much in them. Grocery shopping in my own freezer and cupboard is challenging for me bc it’s easier to do a new weekly menu go buy it and forget the stuff I already have? My groceries cost about $1200 for 4 people per month, that includes paper products, cleaners AND supplements which is a lot. So I am not going to feel guilty about what I spend. This month it will be $950. It’s not great but better and I will build on that! Thank you Jessica for the learning experience. You still saved 20% so good for you! Although my pantry challenge is officially over, I’m still going to comment lol. I’m sorry you’re still sick! So many nasty bugs floating around this year. B: smoothies for my daughter and me, peaches/cottage cheese for hubby. L: my daughter has been BEGGING for lettuce and tomato sandwiches, so I made her one. Hubby had his usual frozen entree. I had leftover ham and bean soup. D: crescent dogs (hot dogs wrapped in crescent rolls), chips, and veggie sticks. L: lettuce and tomato sandwich for daughter, frozen entree for hubby, I ate out with a friend. D: sausage and farro, broccoli. We’re going to continue on with the challenge for another week or two, at least as far as meat and grains are concerned. It’ll be a while before the freezer and grain shelf in the pantry are cleared out! Hope you feel better soon Jessica. Really appreciate the fact that you have kept the PC going despite feeling bad!! As I said the other day, I have spent half my budget this month so am feeling good about that! I will definitely be continuing. This has really become our ‘norm’, trying to use what’s already in the freezers etc. Not every month is successful but we keep going. I’m hoping Jessica is good enough again this year to put up a page for those who plan to keep going, because it is the support of others that keep us going! L – turkey, cream cheese and cranberry sauce on french bread. Turkey is all gone!! S – fend for yourself night/eating at different times! I finished the stir fry from the night before and the little bit of rice pudding that was taking up space in the fridge. Hubby had a salad that used up the last of the steak from the weekend, some hard boiled eggs and who knows what else!! A good clean out day!! I linked to a page in tonight’s post. It looks a little different than the past, but hope it will work just as well! Really hope the cold goes away (again) and stays away. I admit that winter/flu season is the one time of year I do always want to rush. Normally I try to just enjoy each day, but I despise winter and germs. L: Greek yogurt with honey and an apple (I was reminded I can not eat yogurt like that – I could hardly breathe in my pants afterwards. D: Sloppy Joe’s. Husband and kids had theirs with a roll and fries. Kids had grapes and carrots. I had mine over spaghetti squash – love it that way. Snacks: Ice cream bar for the kids, almond butter on a tortilla for me and then after dinner a piece of dark chocolate. Husband had a few things I think – I just know he had a chocolate chip cookie. Our garage freezer looks exactly like yours except still really full. I definitely will be living off of freezer stuff for a while. At least for the majority of the protein meals. I also have a ton of larabars frozen, so those will take time to get through – I don’t eat them often. So sorry this sickness is still harassing you, goodness, these viruses are hardy this year! Rest as much as you can. My daughter has it as well but still pushing thru with her Americorps project in Nola and she was in Houston last week too. I guess she got to rest on the ride to and from. Yes, we are in the home stretch. I wasn’t able to get as much out of the freezer as I had wanted to but I will keep plugging along. I have 2 Zaycon orders coming in February with 3 products – bacon, shrimp and b/s chicken thighs. I will put the newer stuff in back so I can easily find the older stuff. I found items that are over a year old that I need to use. I’m sorry you’re down with another germ ! I still have my illness. My mom’s friend said she had chills 3 weeks with hers. It’ll be 3 weeks next Monday for me . I have my Aldi list for Saturday all written . Oatmeal with peanut butter and cranberries . I am planning a freezer cooking session for Saturday . We ate a lot of our freezer stash this month. We’re on vacation so not posting meals, but I still enjoy reading everyone’s food adventures! Monday my daughter asked that I bring her two cans of tomatoes when I brought my granddaughter back from dance so we stopped by Grocery Outlet. I hadn’t been all month and truly missed that place. I’m looking forward to some grocery shopping again. I could still go maybe another week with PC… The freezer is near empty, however I still have enough pasta and grains to last another six months. Our February goal is healthy eating and exercise. It’s been a fun, friends! Wow–look at that freezer! Mine are still packed, so I’ll definitely be continuing on into February (and beyond). I, too, hope you have a “Pantry Challengers” page again this year. Tasty is right about the importance of having others to cheer us on. B: Cereal, toast, OJ, coffee. L: Son had a PBJ on ww, string cheese, mandarin, apple slices, dried cranberries, carrot sticks, and cookies. Hubs had the same w/ the addition of yogurt w/ granola and compote. I had a hodgepodge of leftovers. D: Sloppy Joe’s on hm hamburger buns (used Jessica’s recipe–so good! ), salad, apple and orange slices, dill pickles (although son won’t touch the pickles–his loss!). S/D: Son and I had cookies; Hubs had a muffin. B: Scrambled eggs (our hens are still giving us 2-3 eggs a day), LO waffles from the freezer, apple slices, OJ, and coffee. L: Son had PBJ on ww, string cheese, carrot sticks, mandarin, apple slices, dried cranberries, and cookies (yep, the same thing as the day before). Hubs had the same thing w/ the addition of his yogurt w/ granola and compote. Again, the same as before. I got busy and didn’t really eat lunch, just snacked on string cheese, some pistachios, and a muffin at different points in the afternoon. D: LO sloppy Joe’s, corn (from the freezer), hm sauerkraut, salad, dill pickles, and applesauce. I also made another loaf of the bread we eat at breakfast (I’ll need to buy more bread flour in Feb.) and a crock pot of black beans to bag up and store in the freezer for future use as burrito bowls, black bean burgers, etc. I think I can just squeeze them in. I love those sloppy joe’s! Unfortunately, my children do not. 🙁 What’s wrong with them? To be fair, they don’t like any sloppy joe’s. Ha! I can’t keep pickles in the house for more than 5 minutes! They inhale them. My kids don’t like Sloppy Joes, either, so we make Sloppy Janes, or I also call them Soup Burgers. Just cook 1 lb of ground beef and pour in a can of Campbell’s Condensed Chicken and Rice soup, or a similar flavor if you have something else on hand. Simmer for a couple of minutes until some of the liquid reduces. Serve on TOASTED buns spread with MAYO (this really adds to the flavor) and it’ll serve 4. It seems like this crud just hangs on and on. I’m sorry you still aren’t feeling well yet, Jessica. B- The usual- hot cereal for both of us. L- The usual for my husband and I had 3 mini tacos from the back of the refrigerator freezer. B- I had a few cookies and my husband had another bowl of oatmeal. L- soup for my husband. The same old thing. I make huge pots of chicken soup with veggies and freeze them. A quart is good for 4 bowls of soup since he adds more broth and the rice when heating and turns out very thick- more like a stew. A cheap lunch and he likes it. He likes it because I add no salt due to his heart attack several years ago. It likes it because it’s flavorful and the batches are never exactly the same. My farmer’s veggie box was delivered today. We’re having artichokes tonight! I’m happy to be at the end of the challenge although I have LOTS left to get rid of in both pantry and freezer. I have made a menu plan to use up most of it but it will take me all of February. Not ovewhelming amounts of food but being just one person it takes longer to use it up. I know that because of the continuing challenge for me, my food budget for February won’t be over $100. I spent $80 this month to supplement what I had on hand. B- Protein shake and tea for me. Hubby cinnamon oatmeal. L- Hubby and I both had a protein shake,Son#1 had frozen pizza, Son2 school lunch. Supper-. Casserole with hamburger, alfredo sauce and rotini pasta, garlic bread from the sub buns. B- The usual breakfast for both hubby and I.
L- Leftover casserole from night before, Hubby is traveling for work till Thursday night. No idea what he had. Son1 sub bun sandwich with roast beef. Son2 school lunch. Supper- Leftover ribs and leftover fried potatoes and garlic cheese bread. Snack- Son2 found another bag of Check mix-Aldi brand on the back of the shelf. Jessica, I hope this cold isn’t too awful and that you’re feeling somewhat functional. Hopefully it’ll be gone soon. So sorry it’s hit you again. A belated happy birthday to your husband! D: found a small sirloin steak in the freezer that I’d missed when looking through things. Perfect for a homemade chile con carne. Also used the last can of black beans and kidney beans and a can of tomatoes, along with the usual things to flavor it up. Made homemade cornbread. Realized that the same smallish bag of cornmeal has been there for so long (I only use it for cornbread), have used it the past two years in the challenges! And now there’s only about 1 cup left, so only one batch left to make. And I won’t buy any more until I decide to make cornbread again someday. D: son had a frozen jamaican beef pie from the freezer; hubs had dinner that was brought into the bureau for everyone (State of the Union coverage-all hands on deck, etc.). He got home after midnight. Left the house at 7am. Long work day, but par for the course in his world. I had a bowl of the chile con carne and more cornbread. I basically took four sick days this week and didn’t push myself to do much of anything. I think that may be why I actually feel better tonight. Thanks for the well wishes. And you did great, esp with birthdays and company, etc.! S – Leftovers, macaroni, slaw, chicken and peas with fluff for dessert. Sorry you are down again. Get as much rest as you can and stay very hydrated. There doesn’t seem to be much else to do unless you wind up with a secondary infection like I did. It’s nasty this year, for sure, and some people like my husband don’t get it. I’m glad he is healthy, but it doesn’t seem fair that I am so susceptible and he isn’t. I will also be continuing on trying to get the pantry and freezers in better control. Thank you for sharing your tips and knowledge about the PC. Also thanks providing this forum for us to share the experience and ideas while doing our own unique versions of the challenge. Breakfast – English Muffin Egg Mc Nuthin’ sandwich (egg over easy with a TBS of colby jack cheese); decaf coffee. Lunch – bowl of pinto beans! DInner – Ham and Cheese Strata with Dutch Baby pancake and canned fruit from the pantry. Total spent on food for JAN: 104.46. But the ham was worth it! Shopping for the second time this month and the last, we spent $91.70 and sadly over spent my savings goal so into February we go. I am determined to save as much if not more in February, I was shooting for a savings of $125.00 and only managed to cut it down by $67.00. Back to work and had the usual breakfast and lunches. Lunch: salad, leftover potato soup and mandarin, hubby had leftover potato soup and ? Yesterday’s Panko crusted salmon didn’t happen. I did however make the salmon since I had pulled it out of the freezer. King salmon is one thing we do order every May when they’re in season. I buy 2-3 whole fish and fillet them up myself and vacuum seal into the freezer. I didn’t have Panko on hand (I thought for sure I did but NOPE) so I surveyed the fridge and decided on Salmkn Niçoise salads. So good. Was prob better than the original plan. Haha. I just blanched some green beans, roasted some red potatoes (not traditional I know but kids prefer roasted), hard cooked some eggs (days are getting longer and my hens gave us 9 eggs that day! ), I had leaf and Boston lettuce already washed and cut. Made a quick lemon dojo in dressing and some garlic bread from the freezer and we were in business. I did add radishes, tomatoes, and avocado. Leftovers will be enjoyed by me for lunch tomorrow! Breakfast: fried egg on plan bagel for oldest, green smoothies for all. I had a piece of chocolate cake and some chocolate Milk. Gotta be truthful. Lol. Lunch: leftovers for all in packed lunches or at home. Last day of the stuffed zucchini. Thank goodness I was tiring of it. Lol. Dinner: polish beef and cabbage buns. I made a double batch, but I doubt there will be enough to freeze. Made a quick minestrone to go along with. Used up frozen whole tomatoes for that, and all the getting limp veggies I had. Score! Also baked a lot today. 3 loaves of whole wheat quinoa bread, cinnamon rolls, Meyer lemon bars, and cranberry bliss bars. The oven was busy. Take care everyone! Jessica I hope you are on the mend. Brooke, I admire how healthy you feed your family! I also admire how much you get done in a day!! You are rockin’ it momma! !